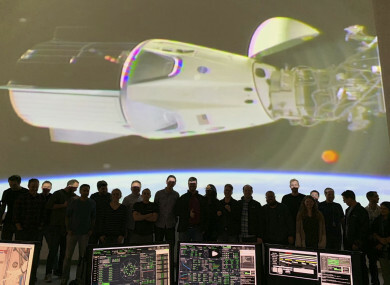 The SpaceX team in Hawthorne, California watches as the SpaceX Crew Dragon docks with the International Space Station’s Harmony module. SPACEX’S NEW DRAGON capsule successfully docked on the International Space Station today, NASA and SpaceX confirmed during a live broadcast of the mission. “We can confirm hard capture is complete,” NASA said. The docking began at 10.51 am Irish time, more than 400 kilometres above the Earth’s surface, north of New Zealand – and 27 hours after the capsule’s launch on a SpaceX Falcon 9 rocket from the Kennedy Space Center at Cape Canaveral in Florida. Although the contact appeared slow, the ISS and the capsule were moving at a speed of over 27,000 kilometres per hour in orbit around the Earth. On board the ISS, the crew – American Anne McClain, Russian Oleg Kononenko, and Canadian David Saint-Jacques – were scheduled to open the airlock at 1.30 pm Irish time. The Dragon capsule will remain on the ISS until Friday before detaching to splash down in the Atlantic. It will be slowed by four parachutes, in what is the one of the mission’s riskiest stages. SpaceX, founded by billionaire Elon Musk, has made the trip to the ISS a dozen times before since 2012, but only to refuel the station. Transporting people is a more complex task, requiring seats, a pressurised cabin with breathable air, temperature regulation and emergency infrastructure. It pays Russia to get its people up to the ISS orbiting research facility at a cost of $82 million (€72 million) per head for a round trip. In 2014, the US space agency awarded contracts to SpaceX and Boeing for them to take over this task. In SpaceX’s case, NASA has agreed to pay $2.6 billion (€2.29 billion) for six round trips to the ISS. The switch from NASA owning spacecraft to paying private firms for a service was initiated under former president Barack Obama – but due to development delays, has come to fruition under US President Donald Trump. “We’ve got NASA “rocking” again. Great activity and success. Congrats to SPACEX and all!” Trump tweeted Saturday evening. Since 2017, NASA’s official mission has been to return to the Moon – a project awarded $21.5 billion (€18.9 billion) by Congress in the 2019 budget. “As a country, we’re looking forward to being one customer of many customers, in a robust commercial marketplace in low Earth orbit, so that we can drive down costs and increase access in ways that historically have not been possible,” he said yesterday following Dragon’s launch. But Musk has admitted that marketing travel in the Dragon capsule is not a priority – and he is more interested in distant exploration of the solar system. At the post-launch press conference yesterday, he reiterated his dream for a permanent Moon base – and sending people to Mars. Musk has already locked in his first private customer to fly to the Moon: Japanese billionaire Yusaku Maezawa. But it won’t happen before 2023 – with the rocket, far more powerful than that used for the Dragon mission, still in development. Email “SpaceX Dragon capsule docks with International Space Station”. Feedback on “SpaceX Dragon capsule docks with International Space Station”.